In a world where cost was no object, the answer to such questions is simple. Would you rather have the ordinary or the extraordinary? For a special occasion, would you rather wear a dress or suit off-the-rack or have one that was tailor made just for you? Would you rather live in a tract home, indistinguishable from every other one in the neighborhood, or a custom-built estate designed and decorated to fit your lifestyle? Would you rather drive a 4-cylinder econo-box or a hand-built Italian supercar? For the tasks you face at work, would you rather tackle them with off-the-shelf software or customizable, bespoke software that can be tailored and molded to your specific needs. For 28 years C Tech has embraced the concept of Bespoke Software. Our flagship software has never been a software application, but rather a toolbox or artist’s palette with which you can create your own tailor-made applications to suit the needs of every project you undertake. We appreciate that this suggests that the use of our software requires an artist, skilled craftsman, or in the case of software, a computer scientist, but such is not the case. For nearly three decades we have dominated the Earth Science software market with our software which has been embraced by the vast majority of the world’s largest engineering firms. We’ve achieved this status by developing a product that is quickly learned, yet never outgrown. One with the power and extensibility to address the most challenging modeling tasks, while being approachable by professionals for whom computer science is not to be found on their resumé. How is this achieved? If you’ve never worked with our high-level object-oriented modular software, the closest familiar analogy would be an organizational flowchart. These flowcharts specify the chain of command within an organization. To an extent, they identify how commands are processed from top-to-bottom and how decisions are carried out. They can even provide insight into the flow of materials and resources. However, a flowchart is just a static representation of a real organizational entity. 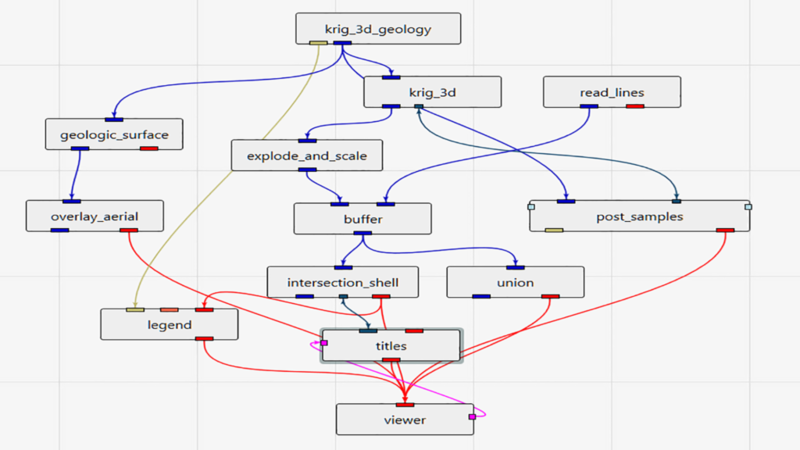 With C Tech’s Earth Volumetric Studio, our users build their own Bespoke Applications using pre-built modules which they interconnect much like a flowchart, as shown in the example below. The majority of the modules and the majority of the sample applications are very much like the majority of tools in an auto-mechanic’s roll-away tool chest. On any given day or week, the mechanic might use 5% of their tools. The rest are there for that unusual situation that may or may not come. Similarly, our users do not need to be fluent in all of our modules to use the software at a truly expert level. They have our technical support as their ready-resource when the time comes that they need to tackle that bizarre task which requires an uncommon module. All we need to do is guide them to one of our sample projects which demonstrates the module’s use, and they are off and running. For the most complex concepts, such as working with Time-Domain Data or Optimizing Fully 3D-Anisotropic Variography, advanced training classes are available. The ability to customize doesn’t preclude standardization. Many of our customers have developed their own 3D Modeling Standard Applications, which they apply to the majority of their projects. Having their own standards gives their company’s work its own unique signature. Their standard applications can be reused on new projects with great efficiency which makes them more competitive, and further benefits their customers through cost savings.